The combination of an upholstered, leather-covered seat shell and a striking four-legged wooden base makes HAL Leather Wood a very elegant and stylish version in the HAL family of chairs by Jasper Morrison. Polypropylene covered in split leather. 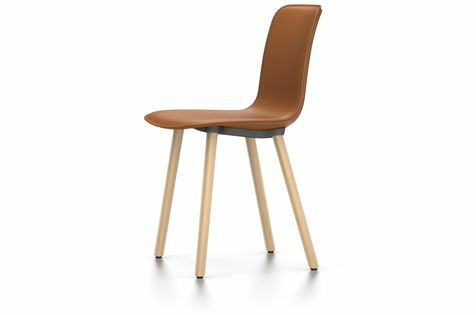 The chair is available in a selection of different colours and wood varieties. Non-stackable wooden base in light oak, dark oak or black-pigmented walnut. Seat shell and base connection in die-cast aluminium, powdercoated finish.